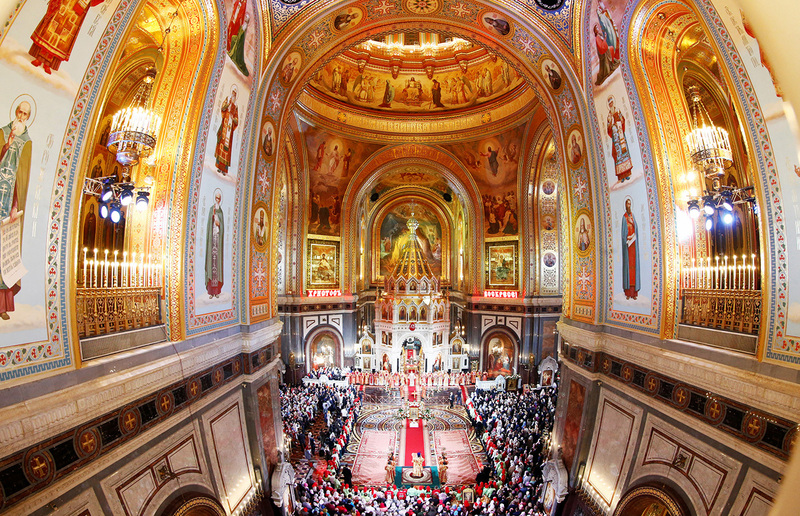 Believers attend an Orthodox Easter service at the Christ the Saviour Cathedral in Moscow, May 1, 2016. This year, Western and Eastern Christians are celebrating Easter on the same day, on April 16, and it won’t happen again until 2025. Nikolai Gogol, the famous 19th century Russian author who preferred living in Italy, wrote that Russia celebrates Easter unlike anywhere else. He pointed out that Russians were particularly focused on the idea of overcoming death, and that Russian culture in general was mostly a culture of Easter, compared to the Western tradition, which was primarily about Christmas. Today in Russia, Easter is still the main Christian holiday. On that day, or rather that night, when the Paschal Vigil and the procession take place, even those people, who usually never go to church and perhaps cannot sort out their relationship with God, make an appearance in church. In some ways, Easter is the most egalitarian holiday observed by the Russian Orthodox because anyone who wants is welcome to participate in the procession around the church, holding a lit candle. That said, many Russians think Catholic Christians pay scant regard to Easter or don’t celebrate it at all, instead primarily observing Christmas and worshiping the Virgin Mary. In reality, the way that various Christian denominations celebrate Easter is more superficial than substantial. The unifying idea of Easter both in Russia and in the West is the belief in Christ’s Resurrection - Orthodox, Catholic, and Protestant Christians all believe in it. Regardless of who celebrates Easter and how it’s celebrated, the Resurrection is the central event of the Gospels, representing the hopes of the faithful who aspire to be resurrected like Christ. In each country, however, Christians celebrate in their own way. The primary point of contention between Western and Eastern Christians is the calendar: the Russian Orthodox Church uses the Julian calendar, which was introduced originally by Julius Caesar in the 1st century BC; and Western churches adopted the Gregorian calendar enacted by Pope Gregory XIII in the 16th century. There’s a 13-day gap between the two calendars, (by 2100, it will be 14 days). In the 4th century, the Church Fathers agreed that Easter would be celebrated on the first Sunday after the first full moon following the spring equinox on March 21. To calculate the first full moon after March 21, however, Orthodox Christians use the Julian calendar, while Catholics use the Gregorian calendar. Another aspect to calculating Easter’s date is the fact that the first full moon after the spring equinox sometimes falls on different days. Even so, in about one third of all the cases, Catholics and Orthodox Christians celebrate Easter on the same day. Whatever the exact date of the holiday, the Pope and the Patriarch of Moscow congratulate each other on Easter day. Each time when Easter falls on the same day for all Christian denominations — such as this year — it becomes an opportunity to demonstrate brotherly feelings, and everyone suddenly recalls the idea of Christian unity which is based on a common Gospel. By the way, most of Russia’s Protestant Christians — with the sole exception of the Lutheran Church — calculate the Easter date based on the Julian calendar, like the Russian Orthodox Church. However, the Orthodox Churches of America and Greece switched to the new style, and celebrate Easter on the same day as Catholics. In Russia, the Orthodox Church follows the Julian calendar strictly, because a switch to the new style could cause an outrage among the more conservative parts of the congregation and provoke a schism. Easter is a very important and sacred holiday for Orthodox Christians. After the long services and a time of strict fasting during the week before Easter, the priest, having led the procession outside around the church singing prayers and hymns, stops in front of the closed doors at midnight. Then, he opens them, symbolically opening the Holy Sepulcher and announcing to the world that Christ is risen. Throughout the service, the priest and his congregation exchange customary greetings - ‘Christ is risen!’ and ‘Truly he is risen!’ The whole ritual leaves a lasting impression, and the crowd’s happy shouts pierce the night sky, soaring above houses and the usually still bare trees. Alexander Pushkin, the great Russian poet, wrote that he liked to go to church on Easter because he could hear the voice of the Russian people there. Whereas in the West one of the most prominent symbols of the holiday is the Easter Bunny who brings Easter eggs, in Russia, the eggs are complemented by the kulich, or Easter cake. In all fairness, Easter cakes are quite popular throughout Europe, and there are numerous Italian recipes of Easter pastry, which is sold in Russia too. One authentic Russian culinary tradition is paskha (the name is eponymous with the Russian word for Easter), which is a dish made from farmer’s cheese, raisins, and spices, and molded into the form of a pyramid that symbolizes the Tomb of Christ. As for Easter games, Russia shares them with many other European countries. For example, the Easter egg roll has been a common tradition in Germany and Russia since the 19th century, and it’s now also an annual event in the United States, held on the White House South Lawn. Recently, this tradition has been experiencing a revival in Russia, with many stores selling special slanted tracks used to roll eggs - the aim of the game is to roll one’s egg down the track quicker than others so that it hits the prize at the end of it. Sometimes, ‘battles’ are held where a person hits another’s egg with their own to see whose cracks first. Housewives rival each other, trying to decorate their eggs as creatively as possible, and then give them to each other as presents (by the way, the famous Faberge eggs made for the Emperor were also given as presents to his wife and mother). After the seven weeks of Lent, Easter meals naturally contain a great variety of meat dishes, but the holiday does not have a single signature dish, such as the Christmas roasted goose. Before 1917, many dishes were prepared for Easter, from pig roasts to fowl. Curiously enough, there’s a sad side to Easter celebrations in Russia. A tradition of visiting cemeteries to commemorate dead relatives remains from the Soviet era; people gather at the graves of deceased family members, eating Easter eggs and kuliches, and drinking alcohol. Before the fall of the USSR, the Russian Orthodox Church made no attempt to suppress this custom and the Soviet authorities didn't object to a religious holiday being replaced by a quasi-pagan rite of paying respect to one’s ancestors, as long as people didn’t go to church. The Church still can’t quite suppress this tradition, and people continue to visit cemeteries at Easter, disregarding the clergy’s pleas to choose another day to do it. Then again, one could look at this custom from another angle and think of it as people’s way to keep their Christian roots alive during an era of atheism when there were few churches open.